When I went to Safeway this past week. I bought 9 pounds of ground beef and 6 pounds of ground turkey. When I get a large quantity of meat like this I like to package it up for the freezer with some cooked, some made into meal items and some raw. This is what I did with the meat I bought this past week. I took 1 pound of the ground beef and 1 pound of the ground turkey. I mixed it up with some oatmeal, finely diced onions, pepper, salt and tomato sauce. I mixed these ingredients together and rolled them into meatballs. I placed them on a baking sheet and baked on 350 for 20 minutes. While the meatballs were cooking in the oven. 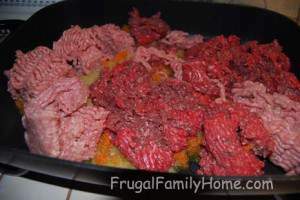 I took most of the first package of ground beef (2.5 pounds) and the rest of the first package of ground turkey (2 pounds) and placed it into my electric skillet with one onion, 4 stalks of celery and 2 carrots that I had finely diced in my food processor. I add the finely diced vegetables to add some extra flavor. Also to sneak in some extra vegetables into our diet. I broke the meat up a little put my skillet on about 325 degrees and let it cook with the lid on. While the meat was cooking in the skillet. I took the last package of ground turkey. I portioned it into half pound balls and placed each ball into a sandwich Ziploc bag. I then placed these into my vacuum seal bags and sealed it up for the freezer. I had one pound of meat left from the first package of ground beef and I split it in half and packed it into two Ziploc sandwich bags. I divided up the last package of ground beef into 9 half pound balls. I placed these into Ziploc sandwich bags. I added all 11 half pound portions of meat to two gallon sized freezer vacuumed bags and sealed them for the freezer. By this time the meatballs were done and I check them with a meat thermometer and let them start to cool. The ground beef in my electric skillet needed to be stirred so I gave it a stir and left the lid slightly ajar to let some of the liquid cook off of it. I put the meatballs into a casserole dish and then to the refrigerator to cool the rest of the way. 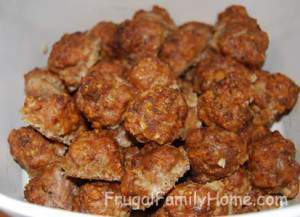 Don’t these meatballs look yummy? 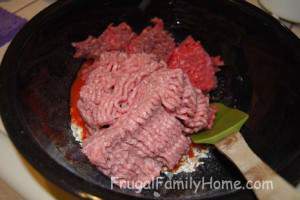 Once the ground meat in my electric skillet was cooked through I transferred it to a large bowl and then into the refrigerator to cool all the way. 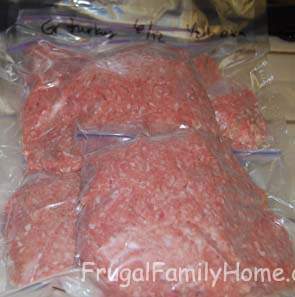 The next morning when the meatballs and ground meat were all cooled I packaged them into meal size packages and placed them into the freezer. If you would rather not cook the meatballs ahead you can form them and place them on a cookie sheet. 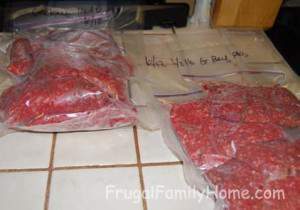 Then freeze them until firm and transfer them into a freezer bag. I cooked my ahead only because with summer coming I don’t want to heat up the house running the oven. So by having them already cooked I can add them to dishes while cooking on the stove top. I like making large batches of meats ahead so I have only one time with prep and clean up. 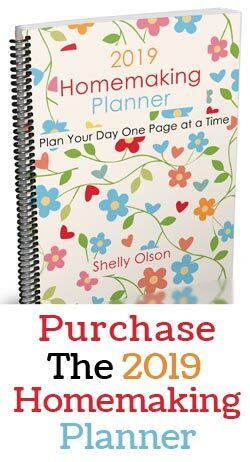 By having the meat packages, I can just take the packages of meat already portioned from the freezer thaw them in the refrigerator. Then just add the meat to the pan. No extra clean up at all. Tacos or burritos just add taco seasoning and simmer. Spaghetti sauce with meat. I actually just place the cooked ground beef frozen in the pot with the pasta sauce and simmer until heated through. Make you own haystacks. I take some salsa, a can of pinto beans and the thawed cooked ground beef and simmer until heated through. 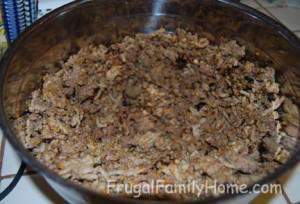 Beef and beans, I add the cooked ground beef to two cans baked beans to the crock pot. Add some diced onion and cook 4 hours. Great over cornbread. This weekend I will be getting a 40 pound box of boneless, skinless chicken breast from Zaycon foods (my referral link). 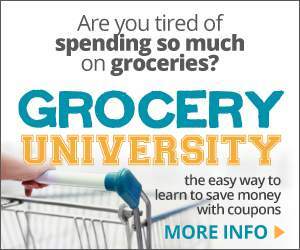 I will only be keeping 20 pounds as I am splitting the box with a friend but I will post about how I bulk batch freezer cook with chicken later this month. 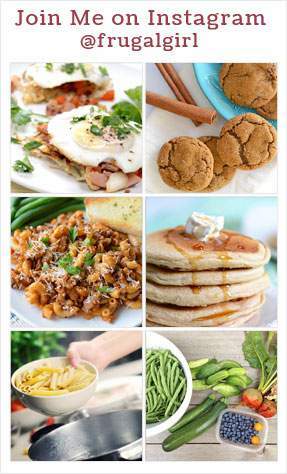 Do you do any batch freezer cooking?